Originally designed for engineers with high track count needs, it features 32 tracks into 8 subgroups. Its balanced insert points on every input and output makes analog outboard gear integration a breeze. 4 transformers and a class A output stage ensures a correct vintage sound. Designed for situations where less track counts are enough, but added flexibility is needed. Its 4 auxiliary sends allows cue mixes, analog reverb and fx sends, parallel compression, etc, all in the analog domain. It also has balanced points on every input and output for outboard gear integration. 4 transformers and a class A output stage ensures a correct vintage sound. Mainly designed as a rackmount 500 Series mixer, it allows 10 tracks to be summed while being processed with 500 series outboard. A passive summing topology employing a class A transformer coupled output stage gives it a classic, vintage 70s sound. 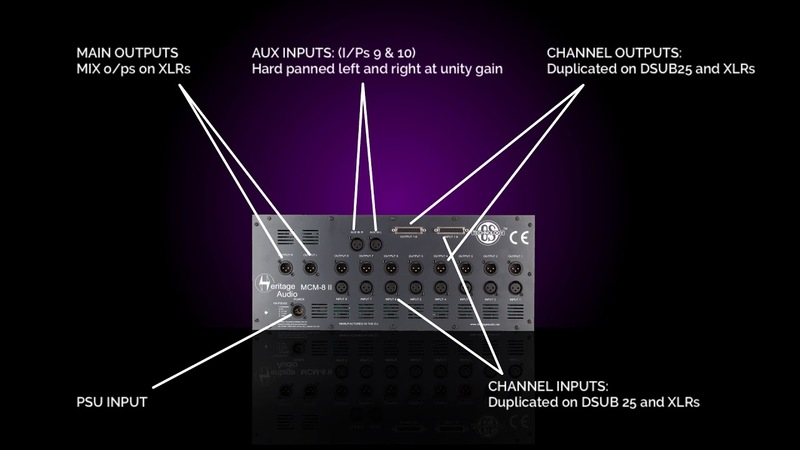 A Heritage Audio´s range of rackmount summing mixers bring the same sound quality level of its modules to a mixing environment. With sonic character as their main goal, an impressively extensive set of features not found in vintage designs round the pack, making the Heritage Audio summing mixers a perfect centerpiece in today’s studio environments. We promise to keep it exciting and minimal. We’ll never contact you other than for sharing our Tech Blog, so you can learn from the top leading heads in the industry, keep you updated about contests, and introduce you to our upcoming products and innovations.